Cambodian Prime Minister Hun Sen lashes out at suggestions of any clash with China over the South China Sea. Leaders of the 10-nation ASEAN bloc have laid the final groundwork for the establishment of an integrated economic community by 2015, but rifts have emerged over how to handle Chinese hegemony following the 20th annual summit of the group. As the summit was wrapped up, key documents were approved that covered workers’ rights, drug initiatives and the overarching declaration of “One Community One Destiny” designed to pave a way for a cherished economic community encompassing about 500 million people. Members also formally called on Western countries to lift sanctions against Burma following last weekend’s by-elections that resulted in pro-democracy icon Aung San Suu Kyi and her National League for Democracy (NLD) winning the vast majority of the 45 seats on offer. However, China’s growing assertiveness and its disputes over the Spratly and Paracel islands in the South China Sea, particularly with Vietnam and the Philippines, cast a shadow over the meeting, which had clearly angered Cambodian Prime Minister Hun Sen.
Hun Sen, speaking at a post-summit press conference, was upset with suggestions that Cambodia was acting as China’s unofficial proxy in a bloc that’s often at political loggerheads with Beijing. He then made a shrill attack on analysts and commentators who question the relationship between Phnom Penh and Beijing or suggest that a conflict between China and members of ASEAN over the Spratly’s is possible, labeling them as crazy, lazy and stupid. It was anything but the statesman-like performance expected of the chair of the Association of Southeast Asian Nations (ASEAN). He also warned journalists, including an international press corps of more than 100, to tell the truth. In saying this, he painted a gushing picture of China as a no-strings-attached and benign benefactor. He then made an extraordinary claim, saying that Beijing had even come to the rescue of Southeast Asian countries during the 1997-98 financial crisis. China, in most commentators’ views, did nothing of the sort. He also launched into a tirade on Cambodia’s opposition political parties and chastised one international official who had wanted Cambodia to privatize its customs in return for aid. China has invested almost $9 billion in Cambodia over recent years through direct aid, soft loans and other forms of financial assistance. Beijing has also taken out long-term leases on islands that are being developed for military purposes off Cambodia’s southern coast. Hun Sen said he hoped to double Cambodia’s trade with China to $5 billion by 2017. However, it was a state visit by Chinese President Hu Jintao just days before this summit began that initially raised eyebrows among observers. As a tribute, Phnom Penh was and still is festooned with Chinese flags and banners. And, in a park outside the Royal Palace – on perhaps the most expensive piece of real estate in the county – giant pictures have been hung on a billboard that leaves little doubt about Cambodia’s close friendship with China. 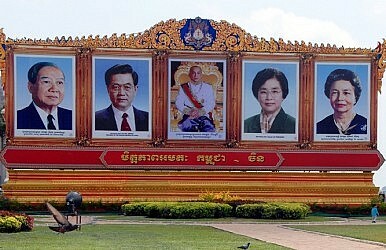 In the center sits King Norodom Sihamoni, either side of him are Hu and his wife Liu Yongqing. They are flanked by the King’s parents Sihanouk and Monique. The dedication struck some delegates and observers as somewhat unusual given Cambodia’s independent role as chair of ASEAN for 2012. “Cambodia cannot be bought,” Hun Sen insisted. During his official visit, Hu told his Cambodian counterparts that as ASEAN hosts they should not be in a hurry to finalize the Document on the Code of Conduct (DOC). The DOC is supposed to be a structured means of dialogue engagement among ASEAN members to avoid any conflict or deal with any confrontation before it escalates into something much worse in the South China Sea. But it hasn’t been completed, and Beijing has made it known that it wants territorial disputes involving the Spratly’s dealt with on a bilateral basis and not at a regional level. Malaysia, Brunei and Taiwan also have varying claims. The Philippines managed to up the ante during the summit by urging a united front within ASEAN for handling China, and its President Benigno Aquino, told ASEAN members that the DOC must remain an internal, central ASEAN document. His delegation then said there had been a “big disagreement” during one session, when ASEAN Secretary General Surin Pitsuwan said China might be invited to take part in the drafting of the code. One delegate said it would be difficult for ASEAN to find a consensus on any Chinese involvement. “What we are objecting to is we don‘t want China to be invited in terms of the drafting and the decision making,”he said, citing Cambodia as one country that was pushing China’s involvement in the writing of the document. ASEAN at present consists of Brunei, Burma, Cambodia, Laos, Indonesia, Malaysia, the Philippines, Singapore, Thailand and Vietnam. Timor-Leste has been widely touted as the next member while Papua New Guinea has also indicated it would like to join the bloc. Many here have suggested that with Cambodia as host, however, that may not matter.